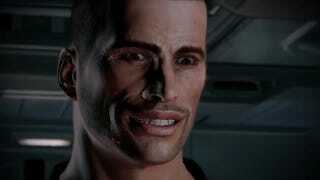 Years ago, game studio BioWare said Mass Effect 3 would be Shepard's last. Now, BioWare is saying that, yep, it was serious. That's it, no more Commander Shepard in Mass Effect 4—or whatever the heck the game's eventually called. Speaking with game site VG247, BioWare Montreal producer Fabrice Condominas said, "There is one thing we are absolutely sure of—there will be no more Shepard, and the trilogy is over." Continuing, Condominas said that this was the team's "starting point", stressing how "vast" and "rich" the Mass Effect universe was. "So first, we don't want to make 'Shepard 2', or Mass Effect 4 with like, 'Oh there's no more Shepard but you're a soldier in the universe,'" said Condominas. "So this will be a very, very different context for sure, and nothing has been decided on the rest." What about a creepy smile? Will the next Mass Effect protagonist have that?